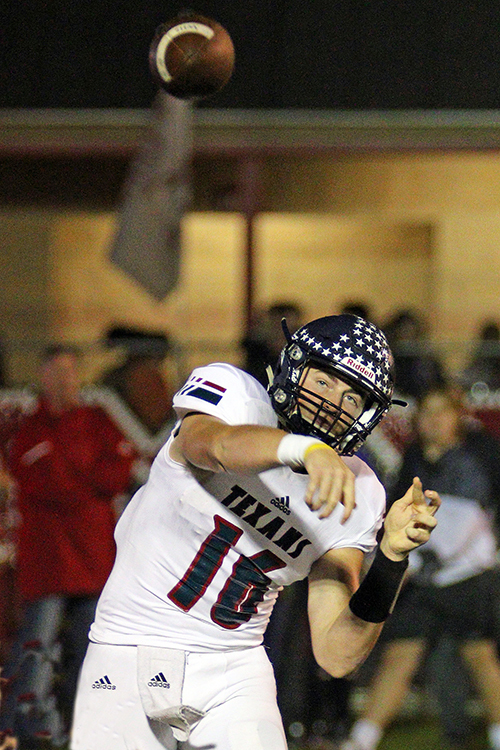 A 35-point first quarter carried the Wimberley Texans to a 52-24 area round playoff win over the Sinton Pirates Friday at Floresville High. Wimberley (11-1) advances to play Sweeney on Friday, Dec. 1 at 7 p.m. in Brenham. Wimberley senior quarterback JoJo Weeks helped Wimberley jump out to a commanding lead by throwing for 216 yards and four touchdowns in the first quarter alone. Senior Cade Koester hauled in three receiving touchdowns and added a 65 yard punt return touchdown early in the second quarter. The Texans went into half time leading 42-10, having recorded 3 sacks, and coming away with two interceptions. The second half was a much more competitive period. While Wimberley was able to put up 10 more points, Sinton etched out 14 points in the second half, mostly led by the powerful running on senior Anthony Villareal. The Texans however, held on to claim the win. Wimberley finished with 476 total yards of offense, while also recording three total take-aways on defense. Koester finished with 217 total yards of offense, which included 133 yards receiving on 6 receptions for 3 touchdowns, and an interception on the defensive side of the ball. Senior Thomas Carruthers ran for 163 yards and a TD on nine carries.